Jesse Michaels, best known as the vocalist/lyricist for influential East Bay ska-punk outfit Operation Ivy, and his band, Common Rider (Dan Lumley and Mass Giorgini), released their debut in 1999 on Panic Button Records. A disappointment following the years of anticipation from Operation Ivy fans everywhere, the record sounded schizophrenic, Michaels and company not sure if they were going to forge a new direction or try and re-live the Operation Ivy days. Whereas Matt Freeman and Tim Armstrong, both of Operation Ivy, went on to form Rancid and preserve the legacy of Op Ivy, Michaels' Common Rider seemed very rusty. With years passed since he had been in a band, the time away didn't do him any favors. 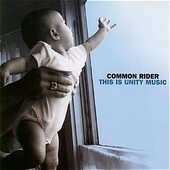 After recording a full-length and playing very sporadically, Common Rider went back to the drawing board, probably the best thing they could do, to write their next full-length. This Is Unity Music is here? They're even touring for the first time, playing on the annual Plea for Peace charity tour. Has this renewed dedication to music and practice writing and performing helped the band? One listen to This Is Unity Music says yes. Though still very much in the learning stages, Common Rider is still trying to find their sound, but are much better this time around at going about it. Michaels' political voice is still in fine form, his words stinging and ringing with pinpoint accuracy. For the music, when the band is playing thrashing pop-punk, they seem to be on to something. When they cross over into gritty ska-punk, they seem to be on less sturdy ground. Still, you can't help but give them a chance over and over again. After all, it is Jesse Michaels from Operation Ivy. So, even after you've given up on the album, you still re-visit it time and time again and, slowly but surely, find it growing on you. I'll give it a C+.